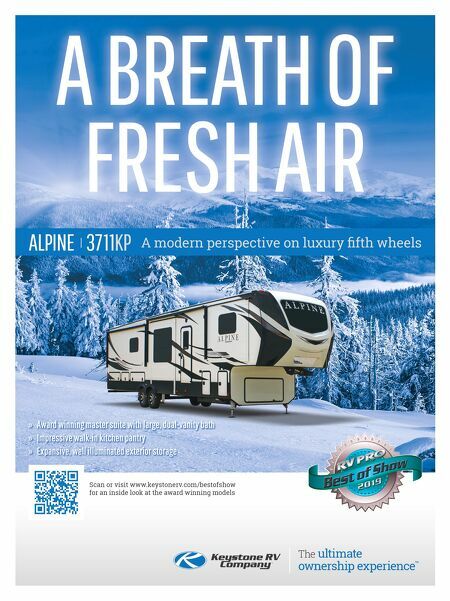 14 • RV PRO • November 2018 rv-pro.com O P E N H O U S E C O V E R A G E Keystone Alpine 3711KP The Alpine 3711KP is a stunning fifth wheel with enough open floorspace to practically host a ballroom dance. All of that space and hefty feel is by design. "We wanted it to be very residential but very motorized," says Keystone President Jeff Runels. "We wanted more storage space for full-timers." Put down two check marks for having achieved both of those goals. In addition to the massive pass-through storage space that is expected of most fifth wheels, the 3711KP has a raised rear frame, adding a second enormous storage space under the rear bedroom and bathroom. That storage compartment comes compete with a slide-out storage tray to make it easier to access the space. On the inside, the 3711KP has a large front living area with two tri-fold sleeper sofas and theater seating. The entertainment center at the front includes a fireplace and a large television on a lifter, that can be lowered to take advantage of the automo- tive-style front windshield. With opposing slides, the living room would dwarf some apartment living rooms. In the kitchen, ample storage space is available in two pan- tries, including a large walk-in butler pantry with sliding door. It is large enough to have storage on the back wall as well as on each side of the entry door. Again, opposing slides make for a large kitchen full of full-sized Furrion appliances. "We've got about 12 inches more than our competitors, which allowed us to do a little bigger island," Runels says. "It's all about being residential." If all of that size wasn't enough, the bedroom features a 70-by-80 king bed with two wardrobes, a chest with a pop-up TV and plenty of USB and electrical outlets. But the rear bathroom may be the showpiece of the coach. It has a full walk-in shower, his-and-hers sinks, "and then there's the dance floor," Runels jokes of the sizeable room. The 42-foot coach features five slide-outs and two awnings and includes a 2-inch receiver hitch on the back for accessories such as a bike rack. The MSRP is $89,900. What impressed RV PRO: It's hard to decide whether to be more impressed with the attractive front living area or the enormous rear bathroom with his-and-hers vanities. And that doesn't even take into account the mid-kitchen with a walk-in pantry, residential refrigerator and dinette seating four. Every- thing about the Alpine 3711KP says, "This was built for the discerning RVer." 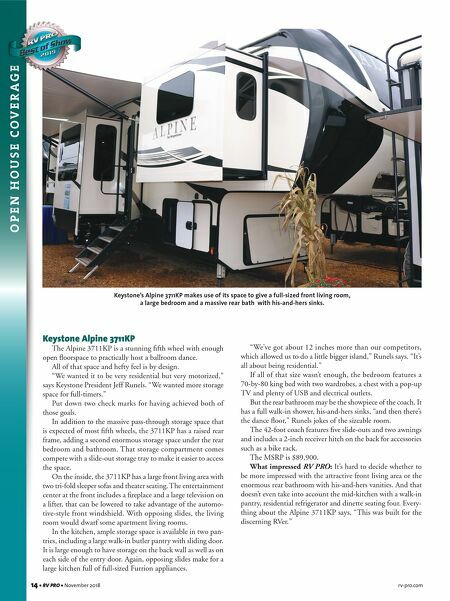 Keystone's Alpine 3711KP makes use of its space to give a full-sized front living room, a large bedroom and a massive rear bath with his-and-hers sinks.